About a year ago, I was all amped up about the possible pitching staff at South Bend to begin 2018. The thought of Cory Abbott, Erich Uelmen, Jose Albertos, and Javier Assad towing the rubber everyday was very exciting. Heading towards 2019, I’m getting the same feeling about South Bend. However in 2019, my heart is looking at the outfield and the possibility of elite talent roaming around out there. There are five names who pop out as possible players in the outfield at South Bend. Three of them played at Eugene last year and the other two were second round picks in the 2018 MLB Draft. They are not going to all be there at once because they all need to play every day, but they should all be there at some point in 2019. I was a little surprised to see Nelson Velazquez play so early in South Bend last year. He played with the squad all through spring training before some minor injuries sidelined him for about six weeks. That lay off set him back and he never seemed to get going at South Bend. However, he did get his game going in Eugene and was the Cubs’ August player of the month. Velazquez looked like a different hitter in August than in May. At South Bend, he was flailing away at almost anything. In August, he came across as a patient hitter who laid off pitch after pitch on the outside part of the plate, down and away, and up in the zone. He looked to be concentrating on a certain zone. I’m excited to see what he can do as a 20-year-old next year. If you’re not excited to see Fernando Kelli next year, you might want to check your pulse. Kelli does have a lot of work to do as a hitter, but that’s not going to stop him from getting on base. I don’t think I’ve seen a runner with his ability to disrupt the flow of the game and rattle pitchers, catchers and fielders like Kelli did in quite a while. There were certain series last year where Kelli just befuddled the opponent into making mistake after mistake. It’ll be interesting to see what he can get away with this year in the more advanced Midwest League. Jonathan Sierra is a majestic, physical beast. He is no longer the physical Darryl Strawberry clone, but he is now an Adonis with massive power potential. The issue is he has yet to tap into that power on a consistent basis. He also has a hole on a swing on the inside part of the plate. He does have an excellent approach at the plate and great pitch recognition skills, he’s just not able to turn on a ball down and in. He usually is over the top. He just hasn’t figured out to drop his hands. Once he can, look out! If there’s one thing that manager Jimmy Gonzalez has been able to do the past three years, it has been get hitters to improve by making minor adjustments. If he can get Sierra to turn on pitches down and in, Sierra may not be at South Bend very long. 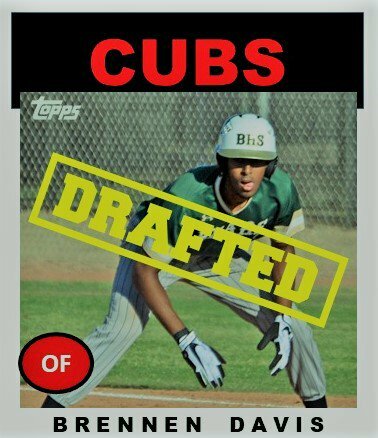 Brennen Davis had a wRC+ of 138 in 18 games for Cubs 2 in Mesa last summer. The second round pick out of high school is tall, pretty athletic, a kid who already knows his way around the strike zone, and can recognize pitches well above his age. He is more than likely to start 2019 in extended spring training but could make it to South Bend as early as May. Ideally, I’d like to see him in Eugene at least for a month before he makes it to South Bend. There is no need to rush him. Then again, anyone who puts up a .431 OBP in Arizona might be worth a second look at South Bend. If he stays healthy, he is my surprise pick. That approach could be special. Cole Roederer is “THEE” guy I look forward to seeing most in 2019. He has the ability to hit for power, average, steal bases, field, and throw – your basic five-tool wonder kid. In 36 games last year in Arizona, he put up a WRC+ of 129 that saw him hit 5 HRs, steal 13 bases, and driving in 24…That’s right 24 RBI in 36 games. Let’s do the projection for a 140 game MiLB season for him…let’s see, carry the one armed man…that’s a 19 HR pace with 93 RBI and 50 SBs…in 140 games. Oh my goodness!!!!!!! I am going to have to remind myself to patient with his progress. He’s still just a kid who only turned 19 this fall. I am pretty sure I felt the same way last year about the outfield in Eugene. It was also a sneak peek into the potential of what those players could be. Throughout the year I saw snippets and flashes of their power, speed, and fear they could cause for the opposition. It’s going to be an exciting year in South Bend. If Roederer and Davis make it there, it is going to be a very special year in the outfield.